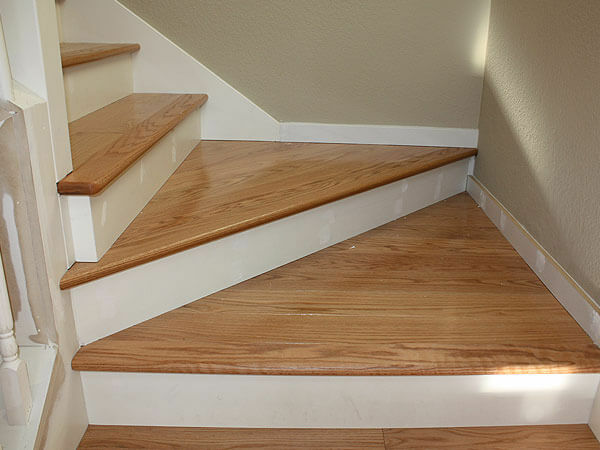 Blueline Floor Coverings is the best choice for custom hardwood stairs in the Bay Area. 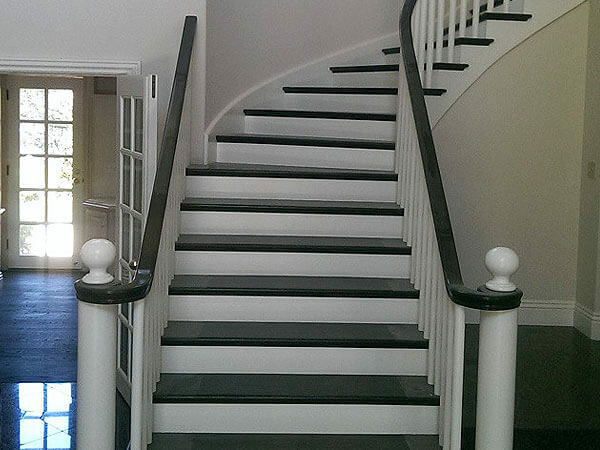 As a licensed C-15 flooring contractor with over 20 years of experience, we have the skills and expertise to craft beautiful custom stairs for homes and businesses throughout San Mateo, Burlingame, Belmont, San Carlos, Redwood City, Palo Alto, and surrounding areas. Over the two decades we have been in business, hundreds of home builders, general contractors, and homeowners have come to rely on us for their wood flooring projects because of our exceptional workmanship, personalized customer service, and affordable prices. As a testament to our excellent reputation, we have earned an average 5-Star rating on Yelp. 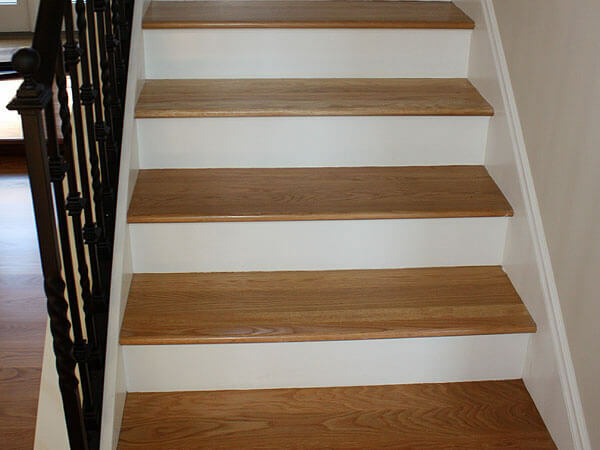 Our premium hardwood stairs can be designed and constructed using the unfinished or prefinished wood of your choice. Some popular wood flooring and stair options include hickory, mahogany, oak, and maple, as well as exotic woods such as teak, Brazilian cherry, and Brazilian walnut. We offer an extensive selection of wood samples at our 1,000 square foot showroom in San Mateo, where one of our experienced and helpful staff can assist you in choosing the best options for your needs and budget. After you choose your preferred wood type and style, one of our experienced installers will come out to your location to take accurate measurements and provide personalized guidance on your project to ensure that the end product fully meets or exceeds your expectations. Blueline Floor Coverings specializes in customizing stairs to elegantly complement each customer's existing decor and flooring and its intended usage. As part of a new wood stair installation, we will also furnish and install all baseboards and mouldings, as well as create custom treads, risers, nosings, stringers, inlays, medallions, and borders. Because our flooring experts have years of hands-on experience and industry expertise, they are thoroughly familiar with the industry's best practices to ensure exceptional results each and every time. 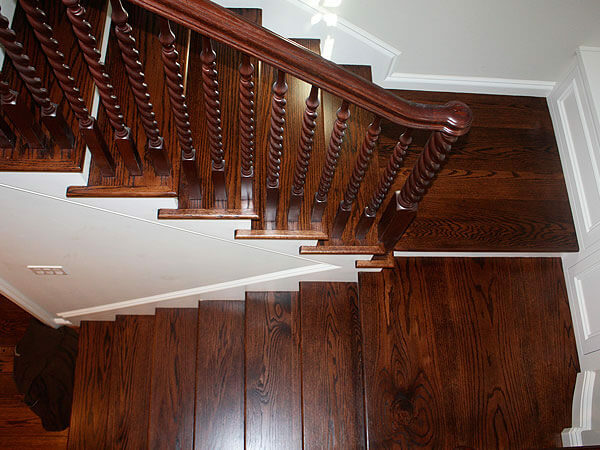 Contact us today to schedule a free onsite consultation and estimate for any of our hardwood stair installation, repair, or refinishing services. We welcome wood flooring projects of all sizes from San Francisco to San Jose, including San Mateo, San Carlos, Belmont, Burlingame, Redwood City, Menlo Park, and surrounding areas.